International dating site and matchmaking service introducing single Russian women seeking a life partner. Honest and reliable marriage agency network helping men from different countries to find a Russian wife. Our International online dating site and quality matchmaking service help thousands of men from around the world to find their charming Russian wives each year. Browse the profiles of thousands of single Russian women and Ukrainian girls, select those who match your criteria and vice-versa and it may a step that will change your life forever. With the help of honest and dependable marriage agencies and experienced matchmakers, we can help serious men to meet single women in most cities of Belarus, Latvia, Moldova, Russia and the Ukraine. Thousands of Belarusian, Ukrainian and Russian single women use our dating site and matchmaking service to find the man who will make their dreams come true: create a strong family and become the loving and charming wife of a decent man. Use our well established international dating site to avoid dating scammers and thus, greatly increase your chances at finding a loving and charming Russian wife. So called “Russian mail order brides” are modern ladies who are using today’s technology to find their soul mate. With the help of their local marriage agency and experienced matchmakers, they broaden their search of a life partner to all regions of the world – in a similar way, men from all over the world are seeking a life partner with similar values in different regions – thus, the concept of international dating. In the past, mail order brides would leave their country, and often their continent, to go marry a man who they never saw in person or spoke to. A typical Russian lady is intelligent, well-educated and expects to be conquered by a man who will do more than ask her to become his wife in the first or second letter, as it used to be in the “mail order brides” years. Nowadays, with the help of their marriage agencies and international matchmaking services, single Russian women have the opportunity to develop relationships with foreigners while emailing, talking over the phone and sharing video meetings with programs such as Skype. It is part of the process that makes it so thousands of Russian ladies become the beautiful brides of lucky men from around the world each year. Working with only honest and reliable marriage agencies has been our main concern since the creation of our international dating service. We feature real beautiful Russian brides and Ukrainian girls. We are proud to work with the best Belarus agency, located in the city of Grodno. We are concerned about our clients’ objectives and have developed quality international marriage services. We focus on providing our clients all the services required from their selection of a Russian bride to the help and advice with the planning of a wedding and the immigration process which follows. 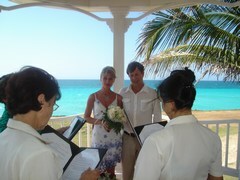 We take great pride in every international marriage generated by our matchmakers and their quality matchmaking service. Our dating website allows people from different cultures to find each other, fall in love and create long lasting relationships. 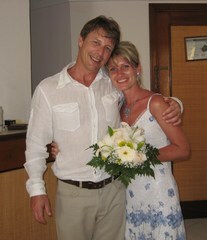 International marriage has a magic aspect and a proven track record of higher success than local marriage. Eastern European women offer the best of both worlds: exquisite beauty and strong family values. Dating scammers and Internet personal scams are not tolerated on our honest and reliable matchmaking service. Agency scams, brides scam and Russian marriage scams are not part of our business philosophy. We prefer quality over quantity. We prefer less income and satisfied clients. As in any sphere of business, some people find a way to abuse the trust of others and unfortunately there are many cases of dating scammers abusing the trust of honest men seeking a life partner. Looking at profiles on Russian women personals or any pretty Russian woman on the numerous dating websites, a normal reaction is to think these women are real and honest and not part of a scammer list. Unfortunately, many dating websites are owned by unscrupulous people who have no respect for human dignity. To the honest and serious men seeking a beautiful bride in Eastern Europe: don’t give up, there are honest dating websites and we are part of them. We reject the application of suspect women and marriage agencies regularly. We do not tolerate any form of agency scams, brides scam and Russian marriage scams. Our marriage agencies in Russia and former USSR offer the best and most efficient Belarus Dating, Russian Dating and Ukrainian Dating on the Internet. 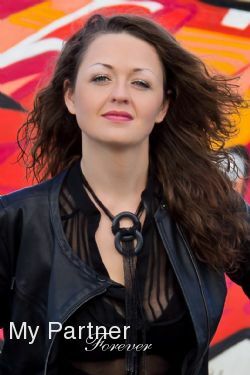 Browse 1000’s of profiles of single Russian and Ukrainian women looking for a life partner. Our international dating service helps men from around the world to find Russian girls for marriage. Russian girls still have the traditional family values which were so dear to our parents and grand-parents. Unfortunately, nowadays many young women in western countries have other life priorities and lost focus at this fundamental value on which relies the foundation of serious and life lasting relationships. If you still believe in these precious values, get in contact one of these charming Russian ladies and it could be a step that will change your life for the better and forever. … Wouldn’t you love to share your life with a girl like this? Are you looking for a beautiful 42 years old girl from Dniepropetrovsk? It is me! My name is Oksana and I’m looking for my second half. My name is Ekaterina. I’m 30 years old. I am single and live in Zaporozhye, Ukraine. I’m 37 years old, divorced and seeking a partner. On our dating site personals, you can browse thousands of real singles and find your perfect Russian bride or Ukrainian wife. Single Russian women become the charming brides of thousands of men every year. Why would a beautiful Russian girl seek a partner in another part of the world? 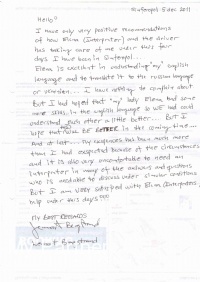 Why would a Russian woman be willing to relocate in another country, thus leaving her family, friends and job? Looking at the profiles of these beauties, many looking like Russian models, it is normal to wonder: why are these women seeking a man outside Russia? Many theories and opinions circulate, one of them being that they seek a way out of their country for a better life. This is the minority; the vast majority of them simply seek a decent man to share their life with. These Russian ladies are often quite beautiful looking, but mostly: they are intelligent, well-educated and hard workers. They like to consider the man as the head of the family. Please, don’t misunderstand: they are not submissive. They are just as independent as any human being should be. Only, part of their heritage makes it so they still consider their man as a strong leader who will protect and lead his family in the good direction. Unlike many western women, they don’t see the need to be independent and self-sufficient within a couple. Isn’t this part of the ingredients which made relationships last a life time in our grand parents’ days? A typical Russian woman, Belarusian woman or Ukrainian woman seeks a good man to create a family with. She looks for a man who will provide financial security, be faithful and be a good leader for his family. Financial security doesn’t mean large estates, nice cars and lots of jewellery; it simply means she looks for a man who can provide a good roof, a good education to their children and always keep his family a top priority. If you share these precious values, then one of these beautiful Russian ladies may be your future wife. Our names are Yuliya and Alain. 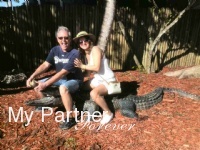 We’re the founders and owners of MyPartnerForever.com. In 2006, we were living on different parts of the world, searching without success for our life partner. 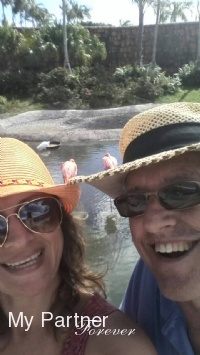 Independently, we decided to register with an international matchmaking service to broaden our search to different parts of the world... and in just a few months we found each other through a matchmaking website similar to this one. Within weeks we could no longer deny it... we had fallen madly in love! Within a year, we were living together with our children (my daughter Anastasiya and Alain’s son, Charles) in Montreal, Canada. We can honestly say that our lives are wonderful and we are grateful for this. We are each other’s “second half” and every day, we fall deeper in love. In fact, even though we’ve been married for years, we wake up in each other’s arms each morning feeling like we’re still on our honeymoon! Our story is truly special... but it is NOT unique. Any good-hearted man, who would like to find a loyal and beautiful Russian woman to share his life with, can reach his goal just as Alain did. If you’d like to talk to one of these beautiful Russian women RIGHT NOW, sign up for our 10-day free trial today! Beautiful women from Kiev, gorgeous brides from St Petersburg and pretty girls from Kherson all have one thing in common: they dream to become the good wife, a beautiful bride and create a strong family. These Russian beauties are intelligent and well educated. As any woman, they know their value and potential and they won’t settle for a green card or a materialistic life. They seek a man who offers similar qualities as they do: intelligence, a good education, a healthy body and mostly; faithfulness and the ability to keep the family the top priority. Since her childhood, a Russian girl is taught by her mother how to become a good wife to her husband and how to always make him proud by being a beautiful bride. This process involves a very healthy diet and regular activities. Obviously, most Russian women apply these principles as they remain very attractive through their whole lives. Russian mail order bride scam, Ukraine bride scammers and agency scams are not part of our organisation. We don’t tolerate any form of scam. Scammers know this and stay away from us. We make sure we work only with honest marriage agencies. We take all required measures to do this, including meeting them in their offices and verifying their way of work. We guarantee that every women registered with our agencies have been met in person, validated their identity with passport, and are motivated at finding a foreign husband. We guarantee that nobody is writing letters with the purpose of generating sales and business. We don’t hide behind curtains. Anyone can see both of us on the homepage of the website. The best way to avoid being scammed is to work with an honest website. We are honest people doing honest business. Russian mail order bride scams, Ukraine dating scammers and agency scams are some of the worst things that can happen to an honest man seeking a Russian bride. The loss of money combined with the breach of trust is devastating. We don’t wish anyone to suffer this and we take all required measures to avoid this from happening. Our online dating service specializes at helping men from around the world to get in touch with single women from Russia and other former USSR countries. With the help of our quality matchmaking service, we help thousands of men to find their loving and charming bride in Belarus, Latvia, Moldova, Russia or the Ukraine. You can begin by browsing the profiles of thousands of single Russian and Ukrainian women and select those who best match your criteria and vice-versa. Then, you begin a correspondence and if you feel a common interest, you can meet on Skype to add a sense of reality to the virtual relationship. Next step: plan to go meet her face to face in her hometown – and we offer all the services you will require so you can concentrate on the goal of your trip that is to meet your future Russian bride!